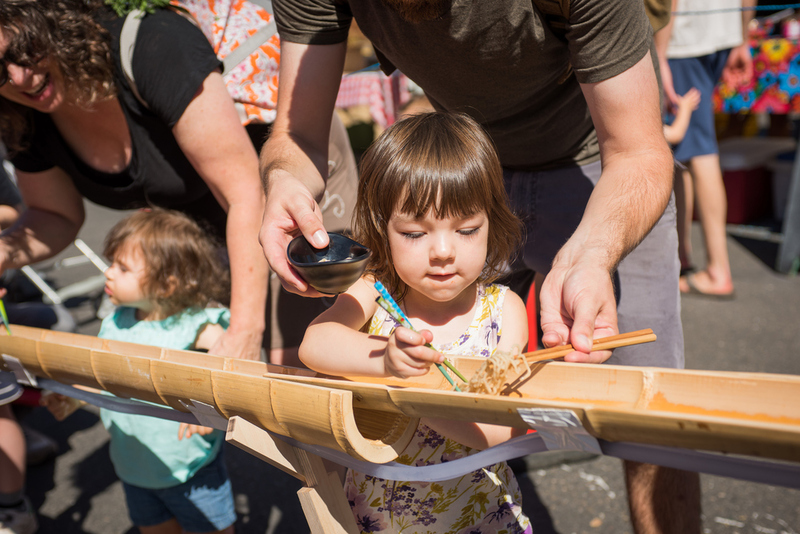 Yesterday, Sunday, August 14, 2016, we hosted the first-ever Umi Organic Noodle Luge at the King Farmers Market. What is a Noodle Luge? It’s inspired by the Japanese summer pastime, Nagashi Somen. With a small bowl in one hand and chopsticks in the other, participants line up along a bamboo flume and try to catch noodles as they flow past. It’s popular with kids, especially, and a great way to practice your chopstick skills. Japanese use slippery, skinny, short somen noodles, but we replaced them with our chewy, 24-inch-long Umi Organic ramen noodles. How did we build the Noodle Luge? Our dear friend Ana Mikolavich split a 10-foot length of bamboo for us. We got two sous-vide circulator pumps, and built ourselves a coursing bamboo waterslide. We placed our Luge Master at top, next to an enormous bowl of very chilled cooked Umi Organic ramen noodles, and he sent bundles down at will. All day long, kids, adults, noodle lovers of all stripes snatched chewy noodles as they coursed down the flume. The Portland Farmers Market hosted a salad bar using our sauce and veggies procured from vendors throughout the market. This was blow-us-away kind of fun! I mean, incredible, joyous fun. A huge thanks to the whole team at the Portland Farmers Market for supporting the event from its conception. And thank goodness for Shawn Linehan, who captured these images of the luge in action. We can’t wait for noodle lugin’ again!